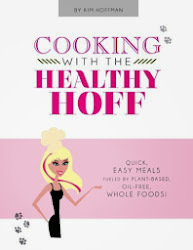 The Healthy Hoff: Corn Stripper! Nothing tastes better than fresh corn! 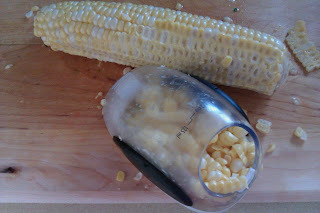 So, when I came upon the OXO Good Grips Corn Stripper, I had to give it a try! Never again will I take a knife to an ear of corn to free the kernels. I won't sugar coat the Corn Stripper, it takes some practice to get the hang of this gadget and the container will only hold about an ears worth of corn at a time and it can get a little messy. But, it does make quick work of removing the kernels without the risk of cutting yourself. You can use this tool on raw or cooked corn. (Yes, you can eat corn raw, it's just a little tough.) When using the tool on hot corn, I suggest using your Ove' Glove (I keep two on hand) to keep from burning yourself. Also, it's easier to start from the wide end and move toward the narrow end.